DroneGP released for iOS ! DroneGP has finally arrived on the first supported platform, iOs ! Be a pioneer in the future of racing with DroneGP 15 ! Experience the first multi copter racing simulator and grow as a pilot of this completely new genre, mastering the controls and challenges that drone racing brings. As in car or motorcycle racing sims, you’ll have to be precise and concentrated to complete a lap successfully, learn to master curve lines and know your vehicle behaviour in every situation. But unlike car or motorcycle racing sims, you’ll have an additional dimension to exploit and keep under control, making for a unique and totally new experience. Compete against advanced AI players that adapt to tracks dynamically and control the same vehicle as you making every race different..
Online leaderboards and multiplayer races grant never ending challenges ! 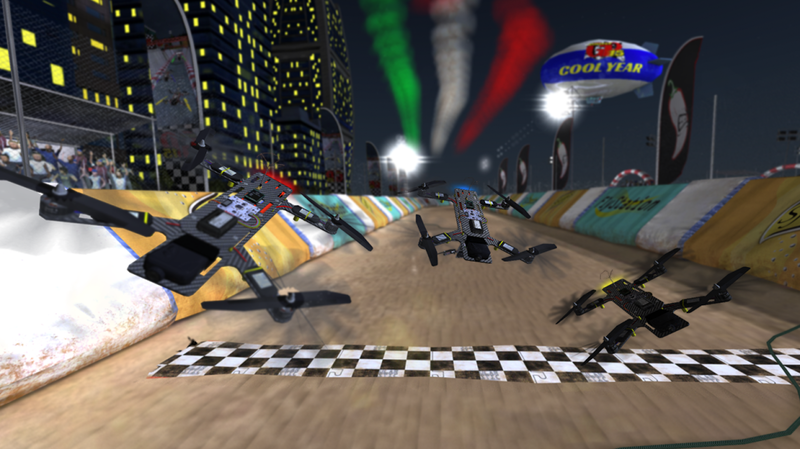 The most advanced and realistic multi copter physics simulation available, all vehicles have a “flight controller” on board exactly as real life ones, and while not yet user tuneable, pro pilots can expect much more in the coming months, and actually help us shape the future of DroneGP on our forums or via email. Learning to master your vehicle won’t be easy, but satisfaction is assured once you get hold of the controls and forces that move your race drone. – The most realistic and advanced multi copter simulation available. – All progress synced with upcoming PC and Mac versions. Pro Pilot ? Check out this post to help us shape the future of DroneGP around you ! Mac and Pc versions of DroneGP with support for RC remotes and general joysticks is coming soon ! In the meantime join the community to discuss about wanted feature and specific platform possibilities. when u mean by “Mac and Pc versions of DroneGP with support for RC remotes and general joysticks is coming soon”, the update of this games mac and pc version has not come out or has it, because cannot find a link to updating it. does this support iPad 2? You can find the minimum requirements on the AppStore, and iPad 2 is unfortunately not supported. im playing this on a brand new iPad mini 4 and it’s really choppy when banking. So much so I’ve stopped playing it. The drone gp on rc plane 3 is perfect and I’m playing that instead. (It just needs more levels!!!!!!!!!!!!) (please). Great thanks for the feedback, hope to fix the banking issue with next update.